Summer is no reason to give up baths - a lukewarm soak with Dr. Teal's Coconut Oil is the perfect way to soothe sunburnt skin with the anti-inflammatory properties of epsom salt and restore flaking skin with moisturizing coconut oil. 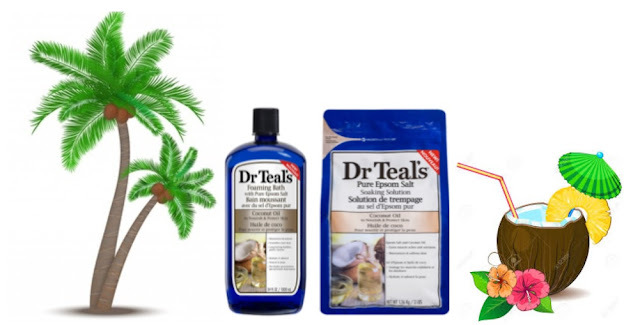 Dr Teal’s Coconut Oil Pure Epsom Salt Soaking Solution and Foaming Bath - hydrates and softens skin with pure epsom salt while revitalizing tired, achy muscles and refreshing skin's appearance, along with nourishing coconut oil to help provide ultimate skin nutrition. Dr Teal's Coconut Oil Foaming Bath - 1000ml - $9.99 - with all the same benefits of the mineral soak along with long lasting bubbles to gently cleanse. Just pour a generous amount under warm, running water for a relaxing bubble bath experience. They both have the same light coconut scent, perfect for pretending you are having your soak in a tropical location so don't forget your pina colada!